GratisDNS Review 2019: Is GratisDNS a Good Hosting? GratisDNS offers basic shared hosting services that are good for personal websites, but be aware that support is somewhat limited and you will need the bankrolls of Bruce Wayne or Oliver Queen to afford after-hours support. GratisDNS is a subsidiary of Larsen Data, a Danish company that’s been in business since 2001. They offer shared hosting and cloud VPS services to clients around the world. Their shared hosting plans are somewhat basic but adequate for many websites. However, their support is lacking and the fees for after-hours support are insane. This service doesn’t list anything in the way of advanced features such as support for Python, free CDN, DDoS protection, or anything that would be considered added value. You’ll need to look into their CloudVPS plans for the ability to support more advanced features. Considering the basic group of features, you’d expect a website builder, but they don’t offer one. Instead, you can use Installatron to install WordPress or dozens of programs such as Drupal and PrestaShop. Otherwise, you can manage your website through FTP access and cPanel. The plan you should pick depends mainly on the amount of storage you need for your website, or for each website if you’re hosting multiple domains. 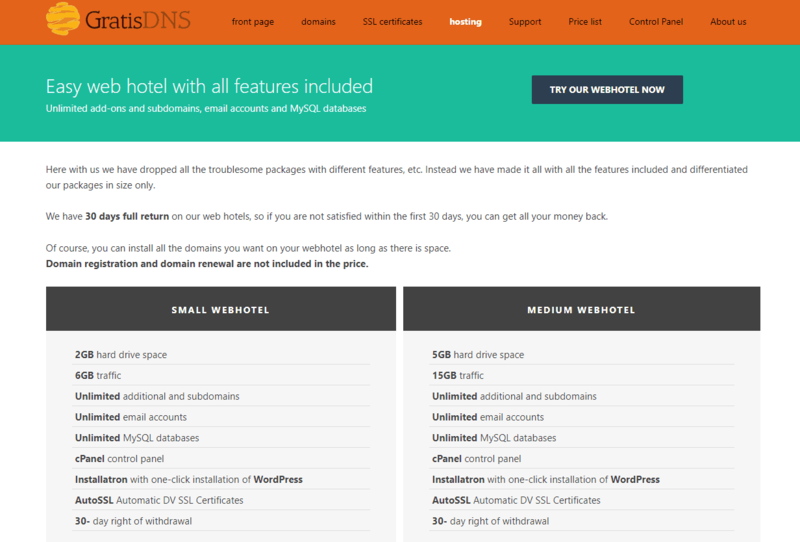 The Small Webhotel plan is OK for a single domain, but otherwise, I’d go with no less than the Medium Webhotel plan. The pricing between the first three plans isn’t that much, so if I were getting a plan here, I’d go with the Large Webhotel plan to start. The XLarge Webhotel plan definitely lives up to its name, and you’re going to pay up for it: it costs more than three times the price of Large. On top of that, none of these shared hosting plans include a free domain registration, so you’ll have to pay extra for that service. Compared to other services, these plans offer average pricing. The exception is the XLarge plan, which is a bit pricey for the features offered. On the plus side, they do have a 30-day money back guarantee, so you can always ask for a full refund if you’re unhappy with their services. One thing I don’t like about this service is that the support is minimal. They only offer email and phone support, and phone support has limited hours. They are only open on weekdays from 10 a.m. to 12 p.m. and from 1 p.m. to 3 p.m. — and that’s assuming they aren’t at a conference or similar event, in which case any assistance could be delayed for up to five working days. If you need to contact them outside of this timeframe, you’ll have to pay for premium support. These charges are very steep. Thirty minutes of support will cost you as much as a year’s worth of hosting, and they bill in 30-minute increments. Another option for support is through mIRC. You can go on the EFNET network and go to their channel #gratisdns. The website claims that employees can be found there. Of course, when was the last time you used mIRC? Come up to the 2000s for chat support, folks. GratisDNS offers solid services that include free SSL certificates, but not much in the way of advanced features. Their support is lacking, and definitely stay away from after-hours support unless you like overpaying for support. Wondering how GratisDNS stacks up against other Web Hosting companies? Enter any other Web Hosting company and we will give you a side-by-side comparison.